Tri-conderoga No. 2 pencil features a sleek, sophisticated, ergonomic design and Microban antimicrobial protection that lasts the lifetime of the product. Thicker diametre and unique "soft-touch" finish makes it more comfortable than the usual pencil. Triangular shape for comfortable writing. Keeps your fingers from cramping. Long-lasting, top quality, premium cedar wood is designed for easy sharpening and has an exclusive graphite core formula for smooth writing. Quality eraser delivers clean smudge-free corrections. Built-in antimicrobial protection continuously fights the growth of microbes, such as stain-causing and odor-causing bacteria. 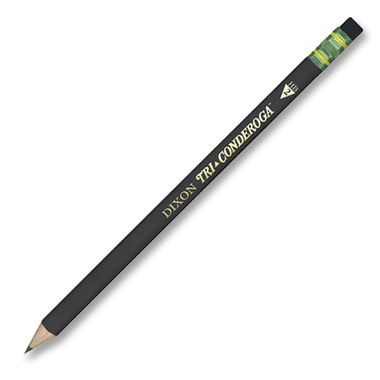 PMA certified nontoxic pencils include a free triangular sharpener. As a teacher, I use these pencils for my students who have fine motor issues - it's nice to hold and it isn't too tiny or too big. Even though the results can smudge a bit, it really helps my kids. LOVE these pencils. Myself and four kids all fight over who gets them (so I bought a box full). Will be buying more. Large diameter and triangular shape is awesome for proper grip, is comfortable, and writes with a nice dark line. Best pencil on the market in our opinion.